The annual Self Assessment deadline is a dreaded day for self-employed individuals across the country. Similarly, keeping on top of your tax during the year is a time-consuming task, and one that many people neglect. Indeed, much of the annual rush is accounted for by the mammoth task of gathering invoices and receipts that should have been filed neatly during the course of the preceding 12 months. Many people choose to seek the help of a tax accountant in order to help them keep on top of their return. If you run a business this is highly recommended. Using a reputable tax accountant means you can concentrate on your business and they will also be able to advise you on ways in which you can keep your tax liabilities to a minimum. If you are self-employed, a tax accountant will be able to ensure that your return is accurate and in on time, while you can concentrate on your own work. The first thing to note is that an accountant will not necessarily take care of your tax affairs throughout the entire year. Most accountants will prepare and Submit Your Return, as your ‘authorised agent’, using information given to them by you. As such, you will still need to keep on top of your filing, making sure that you can give them all your invoices and receipts in an orderly format at the relevant time. However, in choosing your accountant, you may wish to investigate whether or not they offer book-keeping services. This involves your accountant looking after all of your income and outgoings on a weekly or monthly basis, depending on the volume of transactions. They will record all money in and money out in book-keeping software, and will then prepare your return based on that information. This can save a significant amount of time, but you should be prepared to pay more for the service. This is generally charged on a monthly basis, and can easily run to hundreds of pounds over the course of the year. Your book-keeper or accountant can either do the work on your premises, or remotely. 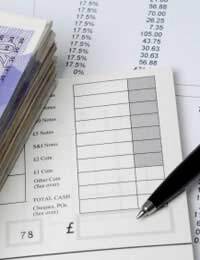 If you run a business, it is likely that you have already sought the advice of an accountant. If you have not, you should seriously consider doing so. Preparing company accounts can be a mammoth task, and one for which some expert knowledge is needed (see our article Understanding the Tax Your Business Will Have to Pay). Again, a tax accountant will either be able to prepare and return your company accounts using information you have given them, or will also offer book-keeping services. When choosing a tax accountant, you should also consider whether or not you will require advice over the course of the year. Many accountants will offer a free initial consultation, during which they will offer advice on ways in which you can lower your tax bill. However, if the nature of your company is likely to change, or if your tax affairs are complex, you may need further advice. As such, you should ask whether they are willing to offer information on an ad hoc basis – and, of course, you should make sure that you choose an accountant with whom you can speak freely and easily. Hiring an accountant can seem like an expensive prospect. However, once the benefits of their advice are factored in, along with the extra hours available to you to run your business, you are likely to find that they pay for themselves very quickly.